Many conditions can cause left lower abdominal pain with palpation. According to MayoClinic.com, the abdomen is a common source of pain or discomfort. The abdomen is divided into four quadrants. Pain in any one of these quadrants can provide clues to the source of the pain. However, sometimes pain in one abdominal quadrant can cause pain in another quadrant. Certain conditions can cause left lower abdominal pain with palpation or pressing in that area. According to the American Academy of Family Physicians, an abdominal trigger point is an often-overlooked source of abdominal pain. In some cases, with careful palpation or abdominal assessment using the hands or fingertips, a localized trigger point--a hyper-irritable nodule or knot within a tight band of abdominal muscle--can be identified. A trigger point in the abdominal muscles of the lower left abdominal quadrant may cause pain in that area, along with pain that radiates over a diffuse area of the abdomen. In the left lower abdomen, trigger points may be found along the lateral or outside margins of the rectus abdominis muscle--one of the principal muscles of the abdomen--or at attachments of muscle and fascia or connective tissue. The AAFP says tender trigger points in the abdomen are usually no larger than 1cm to 2cm in diameter. 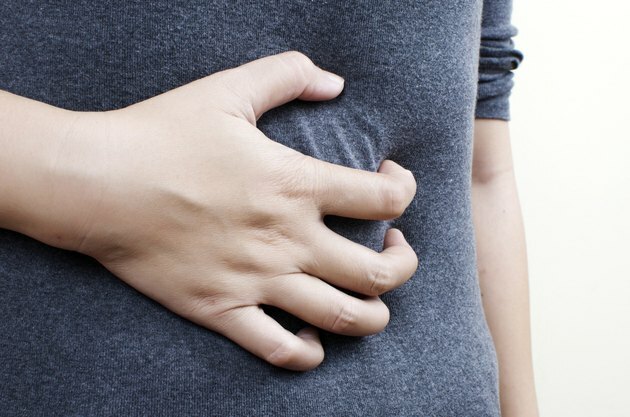 The University of Maryland Medical Center says peritonitis is an inflammation of the peritoneum, a thin membrane that coats the abdominal wall and the abdominal organs. Peritonitis is caused by a bacterial or fungal infection. There are two principal types of peritonitis: primary and secondary. Primary peritonitis accounts for fewer than 1 percent of all cases and is caused by an infection that spreads from the blood and lymph nodes to the peritoneum. Secondary peritonitis occurs when the infection spreads from the gastrointestinal tract to the peritoneum. Common signs and symptoms associated with peritonitis include abdominal swelling and tenderness in the affected area, abdominal pain that ranges from dull and aching to sharp and severe, fever and chills, loss of appetite, nausea, vomiting and reduced urine output. According to the National Institute of Diabetes and Digestive and Kidney Diseases or NIDDK, diverticulitis is an inflammation or infection of one or more diverticula--small, bulging pouches that develop anywhere throughout the digestive system. Diverticula are often found in the sigmoid colon, in the left lower abdomen. Common signs and symptoms associated with diverticulitis include sudden, severe pain in the left lower abdomen, tenderness with abdominal palpation, changes in bowel habits, fever, nausea, vomiting, constipation or diarrhea. MayoClinic.com says the exact cause of diverticulitis is unknown, although certain risk factors may increase the likelihood of developing diverticulitis. These include aging, lack of dietary fiber, lack of exercise and obesity. Possible complications associated with diverticulitis include peritonitis, rectal bleeding and blockage of the colon.